You could buy a simple, utilitarian fireplace screen to keep sparks away from your flooring, or you could invest in this beautiful piece of home art. The graphite, powder coated screen does a terrific job protecting from sparks and excess heat, but that's just the beginning. 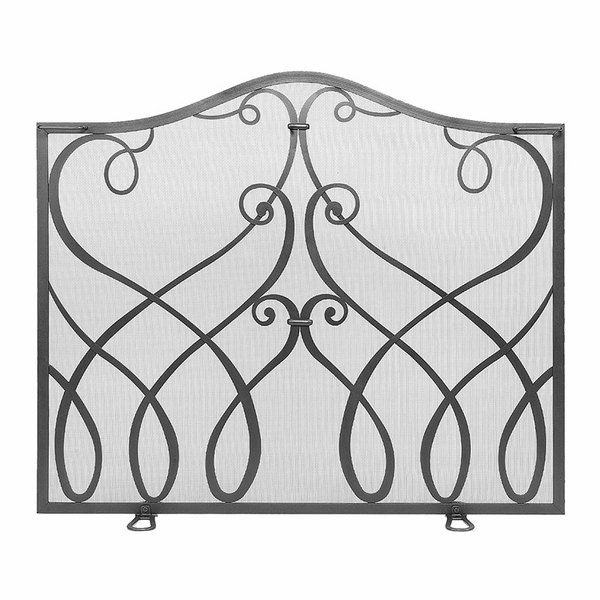 Graceful lines turn the supporting frame into a delicate sculpture that is right at home in the most elegant settings. With Minuteman's reputation for excellence, you don't need to worry about the screen becoming scratched, burned, or bent during normal use. Decorate your own hearth for year-round effect, or pass this screen on to a friend as a thoughtful gift. Is this Minuteman VS21-01 Cypher collection small fireplace screen black or a dark grey? Graphite will be a very dark grey, similar to the tip of a pencil. What is the height on the sides and in the middle of this screen? Per the manufacturer, the middle of the arch is 34 inches in height and tapers down to approximately 30.5 inches at either side.